This Guest Article for REVITALIZATION was written by Kate Hayes. 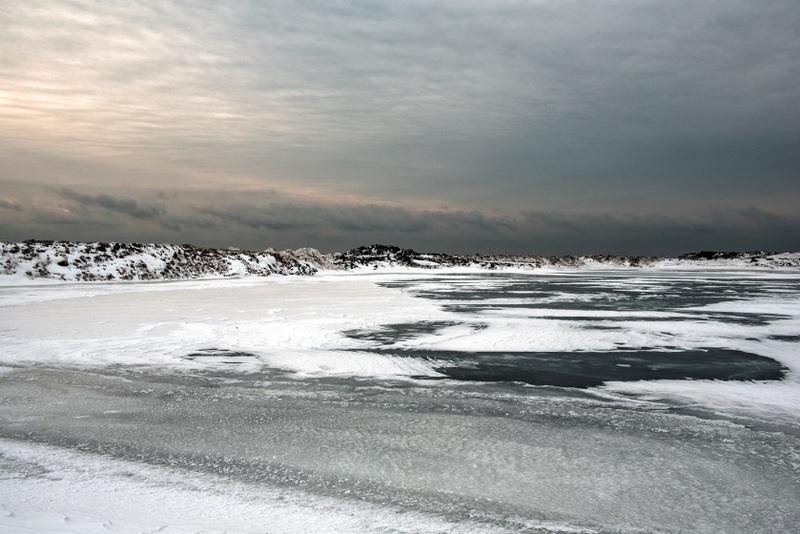 The remains of industries left behind by a changing economy litter the western Lake Ontario shoreline. 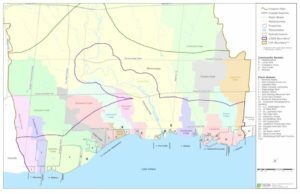 In 2010, Credit Valley Conservation (CVC), the Region of Peel, and the Toronto and Region Conservation Authority (TRCA) began planning to transform some of these currently under-used and ecologically impaired industrial lands. 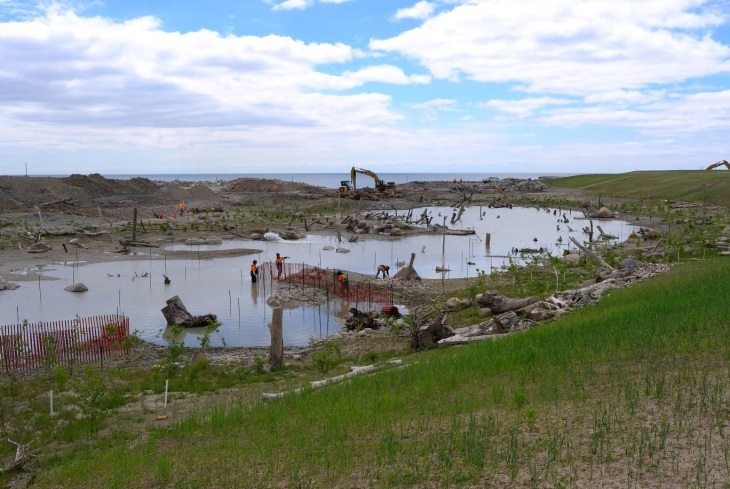 Still under construction, this re-naturalized piece of the Lake Ontario shoreline will comprise 11.8 hectares of meadow, 1 hectare of cobble beach, 4.6 hectares of forest, and 7.7 hectares of coastal wetland and 0.8 hectares of rocky islands. The ultimate size of the new Jim Tovey Lakeview Conservation Area (JTLCA) will be 26 hectares, or about 50 football fields of new habitat. The designs for this project reflect multiple priorities. Among others, these include increasing habitat for species which currently use the area (especially for migratory birds, bats and insects), building rocky islands to mitigate shoreline erosion, and making the site and the shoreline accessible to both people and wildlife. In addition to providing ecological and recreational benefits, the JTLCA will provide useful data and experience on how similar projects can benefit local communities, contribute to climate change preparedness, and create habitat. While we can’t bring the area back to predevelopment ecological conditions, we can increase its biological complexity and recreational opportunities for visitors and residents to enjoy. Credit Valley Conservation seeks opportunities to preserve and to restore natural features and functions across the Credit River Watershed. When presented with an opportunity like the JTLCA, we take a systematic and strategic approach based on extensive experience in watershed management. JLTCA Serson west wetland during construction. Developing a watershed-based conservation plan starts with an overview of the regional biophysical- chemical- and socioeconomic- context. Like many of western Lake Ontario’s watersheds, the Credit River begins in rural, relatively healthier natural areas and flows through increasingly impaired stretches before reaching the lake. 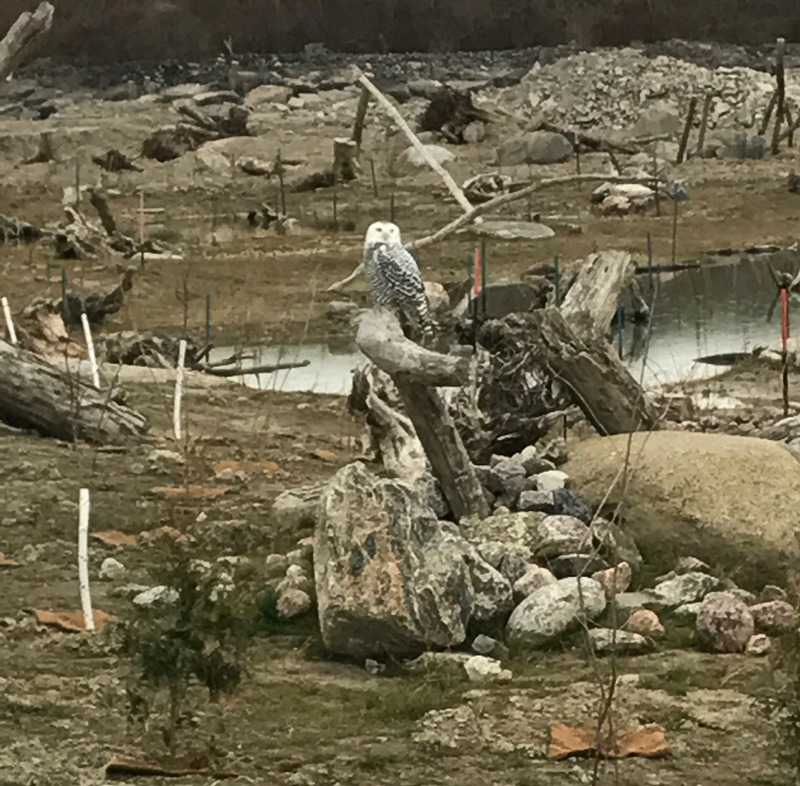 When faced with a 1000 square kilometre watershed in varying states of ecological well-being and with multiple restoration priorities, how can CVC best use its limited resources? CVC’s records over the last twenty years reveal an increase in air temperature and a reduction in snowpack, reflecting our changing climate. The predicted future climate changes are expected to exacerbate the impaired conditions mentioned above. With varying stages of ecological impairment, the restoration and management of natural heritage features and functions necessitate a strategic as opposed to an opportunistic approach. 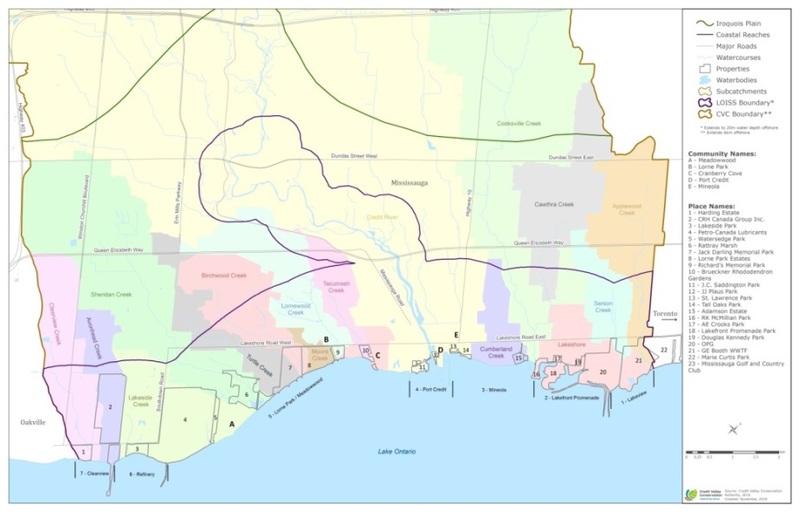 The Credit River Watershed includes 22 individual subwatersheds, that are the basis for CVC’s subwatershed studies. An analysis and integration of distinct but interconnected environmental disciplines make up these reports. Each subwatershed study is unique, but they follow the same three-phase formula. 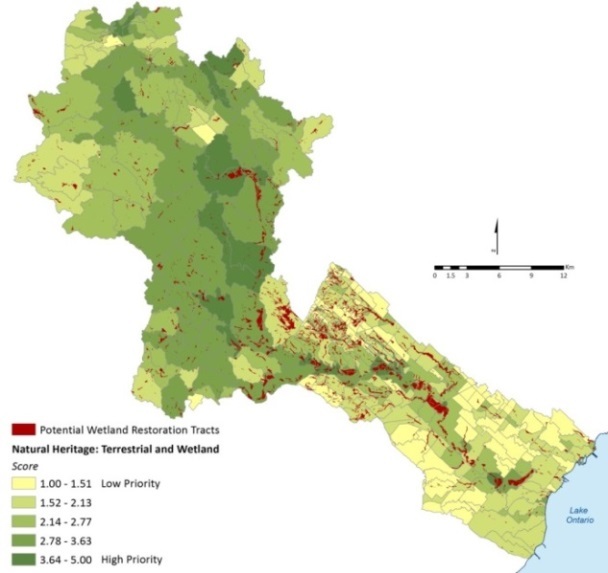 IWRS scores for Natural Heritage: Terrestrial and Wetland metrics. 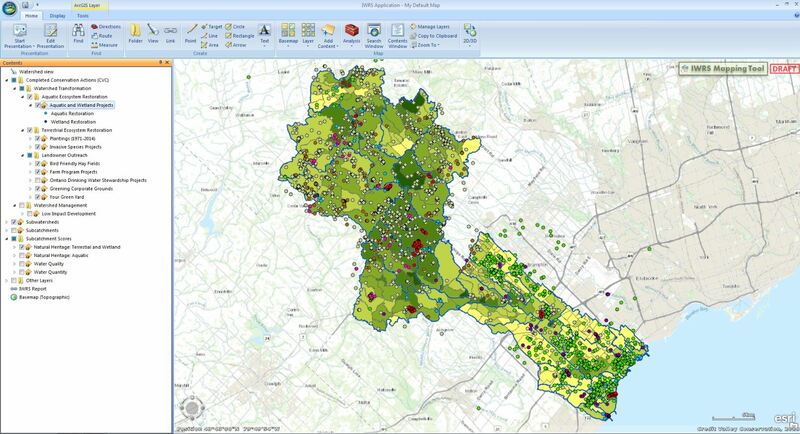 CVC’s Integrated Watershed Restoration Strategy (IWRS 2015) is an example of one tool for ensuring that restoration projects optimally use limited resources for restoring ecosystem features and functions. Because watershed-based resource management is most successful when the analysis is scaled further into communities and neighborhoods, IWRS gives scores at the catchment level. The IWRS has four separate metrics, two for natural heritage (terrestrial and wetland, and aquatic) and two for water (quality and quantity). The natural heritage categories prioritise managing for resilience, therefore giving the highest weighting to conserving and restoring larger ecosystems. On the other hand, water quality and water quantity metrics aim to mitigate flooding, drinking water contamination, surface water pollution, and erosion. IWRS scores are determined by inputs from subwatershed studies, ongoing watershed-wide monitoring, and other sources. We upload the recommended conservation actions identified in subwatershed- and other- related studies to a “Restoration Opportunities” database; following implementation of these conservation actions we migrate projects over to a completed “Conservation Actions” database. We use the resulting data in a range of ways to report back on how we are collectively doing in addressing restoration priorities. In cases of suboptimal results, we prioritize community outreach and education initiatives either geographically or by discipline to increase uptake of conservation actions. IWRS Terrestrial and Wetland: Completed Conservation Actions. IWRS scores also help prioritize restoration projects by landowners. For example, the level of funding a private landowner receives for conservation actions on their property is partially determined by the feature and location. If the property falls within a higher priority catchment it receives a slightly higher score. Also, planting large woodlots or corridors between existing natural patches is preferred to planting rows of single trees for windbreaks or privacy screens. Expanding larger woodlots or planting a vegetated buffer between a road and a stream are similarly preferred. CVC and partners have planted almost 6 million trees since 1955, with 1 million trees planted in the past 10 years alone. Since 2007, we have restored 1500 hectares of forest and grassland habitat, over 11 kms of stream habitat, and 15 ha of wetland habitat. The majority of these projects have been completed in priority areas identified in the IWRS. Using a subwatershed-based planning framework, CVC initiated the Lake Ontario Integrated Shoreline Strategy (LOISS) in 2009. The study area includes 28kms of shoreline, 2 kms inland, and 6 kms into Lake Ontario. The study area captures the lower reaches of the Credit River and portions of 14 individual watersheds that drain directly into Lake Ontario. Lake Ontario Integrated Shoreline Strategy: Study Area. The shoreline is divided into 7 coastal reaches, each with its own characteristics, environmental stressors, and prioritized conservation actions. The eastern reaches—(1) Lakeview and (2) Lakefront Promenade Park—are heavily urbanized areas with little natural cover. Given this, the highest priority for these areas is habitat improvement. In 2010, the City of Mississauga initiated a master planning process, called “Inspiration Lakeview”, to explore opportunities for redevelopment of decommissioned industrial lands in the 2-Lakefront Promenade Park coastal reach. 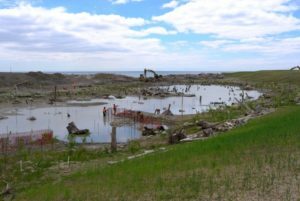 In 2017, Lakeview Community Partners Limited (LCPL) – a consortium of developers – purchased the former industrial lands, previously owned by Ontario Power Generation. LCPL plans to build a new community there, integrated with the lakeshore and the JTLCA. Early plans for Lakeview Village include 7-8000 housing units, several office buildings, retail space, and publicly-owned lands for schools and cultural spaces. The “Inspiration Lakeview” process also identified a strong public interest in reconnecting both people and wildlife to the Lake Ontario shoreline, including the creation of a new greenspace connecting the two eastern shoreline reaches. In response we partnered with the Region of Peel, the Toronto and Region Conservation Authority and the City of Mississauga to explore options, and the JTLCA project was initiated. We completed the Environmental Assessment and detailed design for the JTLCA in 2015. Construction on the project began in 2016. The project has proceeded on schedule, and we hope to open the site to the public by 2026. “Since beginning construction in 2016, we’ve been able to create 10.5 hectares of new land, using clean fill from the Region of Peel’s capital projects. Rather than having contractors haul fill from public works projects to distant landfills, we ask them to bring to the JTLCA. 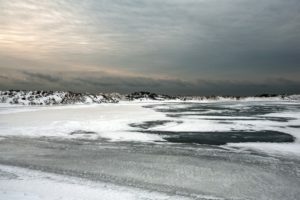 This reduces greenhouse gas emissions and is allowing us to create a 26-hectare Conservation Area in the middle of the Greater Toronto Area’s urbanized lakeshore,” said Andrew Farr, General Manager , Water and Wastewater, Region of Peel. Working with CVC, the Region of Peel and TRCA, LCPL plans to build a publicly accessible, naturalized trail corridor connecting to the JTLCA on its eastern side and to Lakefront Promenade Park on the west. 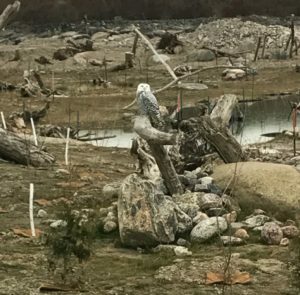 “We have a unique opportunity to not only transform Mississauga’s waterfront, but to revitalize a site that has historically been a net negative for the environment and closed off from the community. By working closely with CVC, the Region of Peel, and TRCA, Lakeview Village can become a destination in the GTA that serves as a model for sustainable waterfront development globally,” said Fabio Mazzocco, President, Lakeview Community Partners Limited. As the trail gets closer to the JTLCA, it will become less manicured, seamlessly moving from the newly developed areas to the newly naturalized ones. Moreover, LCPL is planning the trails that will run through this corridor in such a way that users will be able to see, but not access, the Serson Creek wetland, which forms the western-most side of the JTLCA. CVC has a long history of working with homeowners and businesses. “Never has the need to add more green infrastructure to our cities been more critical. We can do it for many reasons including habitat for wildlife and people but it also cleans and absorbs storm water, cools and cleans the air, and makes our communities more resilient to climate change. But green infrastructure features like Jim Tovey Conservation Area are not islands – they need to be linked and integrated with neighbouring lands and that is where our partnerships with the municipalities and adjacent landowners, like the Lakeview Community Partners, are critical to making the design work as a seamless system – for nature, water management and people.,” said Deborah Martin-Downs, Chief Administrative Officer at CVC. To further promote the JTLCA initiative, we developed a comprehensive communications and engagement strategy. The communications strategy includes a series of tactics, ranging from media releases, to regular releases of videos summarizing the status of construction and restoration. For example, we initiated a photographic exhibit in January 2018—entitled “Morphology”—which details the evolution of the project as interpreted by professional photographers. 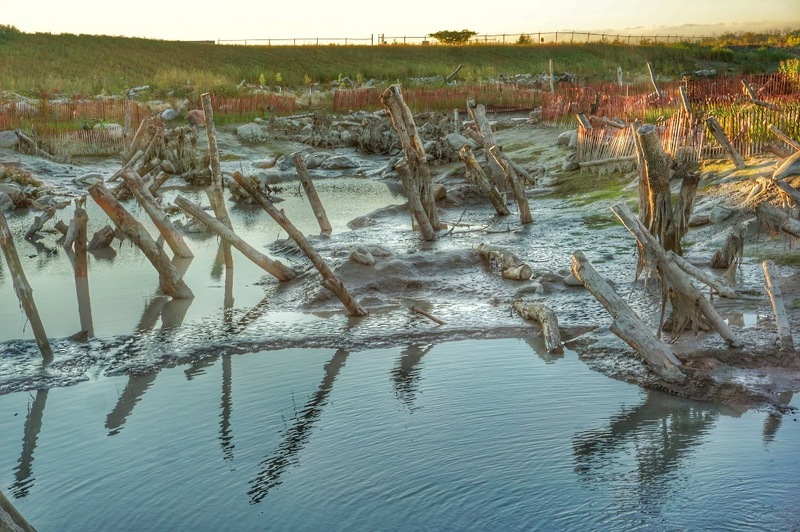 Morphology 2019 was launched on World Water Day (March 22) and opened up for public viewing on March 23rd-24th. The concept for Morphology is the inspiration of the late Mississauga Councillor Jim Tovey, after whom the Conservation Area is named. Looking ahead to the next decade, the United Nations declared 2021-2030 as the UN decade on ecosystem restoration. This initiative aims to increase significantly the scale and pace of restoration of degraded ecosystem features and functions. CVC and partners are well positioned to respond to this global call to action and to leverage the increasing recognition of the fundamental links between human- and ecosystem- health and well-being. We bring state of the art science to the development of watershed-based plans, refined further to reflect subwatershed priority needs. The IWRS facilitates the pursuit of conservation actions based on a consideration of catchment- level priorities and specific metrics. This approach allows us to identify and to pursue priorities based on maximum ecosystem- and economic- return for associated effort. Now more than ever we collectively need to make every dollar- and every restoration initiative- count for climate resilience, for biodiversity and for people. Ontario’s 36 Conservation Authorities operate on a watershed basis and have done so since the provincial government created the enabling legislation in 1946 in response to erosion and flooding. Since then, Ontario has gained over 70 years of experience in watershed-based natural resource management. CVC, itself founded in 1954, has planning jurisdiction over watercourses and riparian zones, manages Conservation Areas and Natural Heritage systems, maps floodplains, provides educational and volunteer opportunities to youth, monitors climate change, and works with private landowners and businesses to naturalize their properties. It manages the Credit River, fourteen smaller adjacent watersheds, and 28 kilometres of the western Lake Ontario shoreline. Learn more about Ontario Conservation Authorities here. 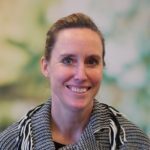 Kate Hayes is Senior Manager, Restoration and Management at Credit Valley Conservation. Kate has experience working in the United States and Canada in the environmental field. She has a particular interest in private/public sector partnerships to advance ecosystem restoration goals. In her capacity as Senior Manager with Credit Valley Conservation, she oversees the Restoration and Management division whose work extends from the north shore of Lake Ontario and all over the Credit River watershed. Staff undertake forest- meadow- wetland- and aquatic- restoration projects. The projects are multi-disciplinary in nature, with a range of stakeholders from all levels of government, non-government, and corporate and individual landowners.